Vehicles able to conquer both land and water were once part of the USSR's future vision, with many unusual models created. But some of these ideas never saw the light of day. MAV stands for "Small Floating Automobile." It was powered by an engine from one of the most popular Soviet cars, the Pobeda (Victory), that was produced in the USSR soon after WWII. The amphibious automobile was allegedly copied from the Ford GPA. The similarities between the two are pretty striking. The GAZ-46 was produced in 1953-1958 and was designed for the transportation of troopers and performing different military tasks on the water. It was really small and could only accommodate five people. The USSR needed bigger amphibious vehicles too, so its automobile designers came up with the BAV model, "Big Floating Automobile." The BAV was also based on an American prototype - an amphibious truck coined the DUCW-353. The USSR received hundreds of these vehicles during WWII as part of the lend-lease program. The Soviet version could carry 28 people or a 2.5-ton load. It was produced until the early 1960s but was used extensively in the Eastern bloc and Middle East countries for two more decades. In the 1960s, the USSR launched another project, this time it was absolutely original. It was called the PTS and was a medium amphibious transport vehicle. It became the forbearer for future amphibious transporters and the latest developments and modifications of the project are still used by the Russian army. The first one was introduced back in 1965. It could carry twice as much as the BAV - five tons. Unlike its predecessor, it was tracked, and was able to operate in areas affected by radiation or biological (chemical) weapons. The most popular Soviet crossover, Niva, even managed to charm tough officials from the Ministry of Defense, who ordered an amphibious version. It was designed in 1976 but it took another decade for the VAZ factory to sort out the engine's cooling system. Overall, 21 of the vehicles were produced but they did not meet the expectations of the Soviet military. Gorbachev's perestroika landed the final blow and the floating Niva concept was scrapped. soldiers from the battlefield and provide munition supplies. It was possible to drive it in a semi-lying position. The LuAz was light enough to be transported by air at the expense of its payload capacity - about 400 kilos. 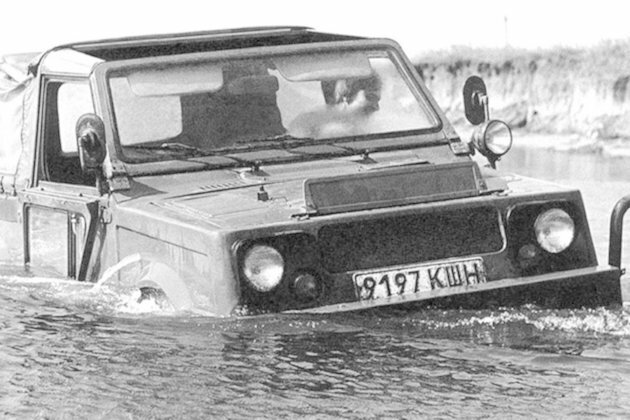 Unlike the amphibious Niva, the vehicle was put into mass production - in the 1960s and 70s. UAZ, an automobile factory in Ulyanovsk (900 km east of Moscow) produces vehicles that were once popular in the USSR and Russia. In the late 1970s, it started developing a light amphibious automobile for the army and border patrol. It had to be able to carry up 600 kilos. The task was finished in the early 1980s. By 1989, UAZ produced 14 Jaguar vehicles. The model could maneuver easily in water, travel up to 100 km/h, and even sustain a shock wave of a nuclear blast. Its designers claimed that no army in the world had such a vehicle. In two years, the army approved it but then the USSR collapsed and the project, like many at the time, was binned.